Udaipur is valued as one of the most beautiful places of the world today and to evidence it Neemach Mataji is the best place as people who have experienced it call it a paradise. This temple of Udaipur has become an attraction over last few years. There are people who visit the temple twice a day. I usually donâ€™t visit temples situated on heights because of not to be discussed reasons. But, this time I visited the temple and thought to share my experience with you all. 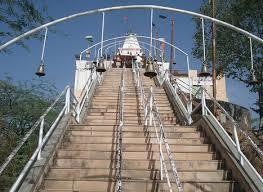 Neemach Mataji is a temple located near Fateh Sagar. It is believed to be built in the year 1652-1680. It is also believed that Shree Nimcha Mata (also known as Ambaji) is the clan Goddess of the Royal family of the Maharanas. This stone idol of the Goddess is 56 inch in height and 23 inch in width. The offer idol of Lord Ganesh is 22.1 inch high and 12.1 inch wide. Outside the inner temple is a Hawan Kund for performance of Yojna. 06.00 am - 08.00 pm. Open on all days. To reach the temple one has to climb the whopping height of 850 meters and can only reach to the peak by foot. It has both stairs and pavement ways to walk up.